Lone Survivor desperately wants to be described with clichéd buzzwords like “authentic,” “gritty” and “visceral,” but never earns such descriptors. 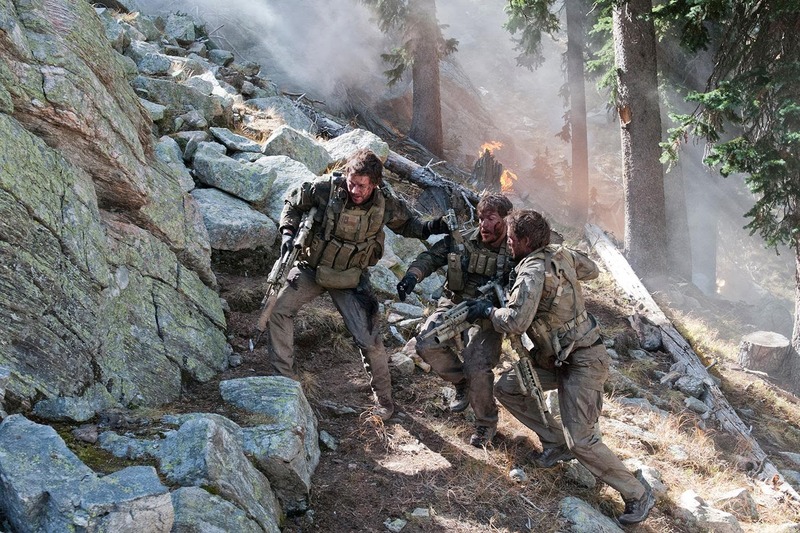 When its four bearded Navy SEALs find themselves outnumbered by hundreds of Taliban guerrilla fighters, the action sequences’ painful physicality (there’s some bone-crunching stuntwork on display) is squandered by poor directorial choices from Peter Berg. The combination of amplified explosions, smash-zooms and sub-Snyder scenes that sluice in and out of slow-motion produce an effect that’s bombastically inauthentic. It’s not without merit. The achingly implausible setting – New Mexico trying and failing to stand in for Afghanistan – serves as both gorgeous backdrop and effective metaphor, as the men are driven from the verdancy of dense, lust woods into barren wilderness dominated by craggy outcrops of stark alabaster rocks. The soundtrack – from Explosions in the Sky– is overt but effective, combining soaring melancholy guitars with driving, militaristic drums. Good review. I agree this is nothing special, though I don’t dislike it quite as much as you do. I think the way it insisted upon itself, aggressively trying to convince you of how moving a story it was (because it totally is, if you’re talking about the real-life story it tried and failed to capture!) made me dislike more than I otherwise would have. That is totally fair. It is definitely, constantly, trying to tell you about its own importance. Good review Dave. The way in which Berg pays more attention to the soldiers, rather than the actual war going on around them, is what really makes this a compelling watch. A bit sentimental, but definitely more emotional than most war flicks I see. This sounds like everything I would hate. I didn’t like this either. Since I posted my less than positive review, I’ve incurred the wrath of some people who can’t separate a movie about war from the actual war itself. I can understand that reaction. As I suggested in my reply to jjames above, the film really goes out of its way to embed itself in the real story of these men, but just because their story is moving/heroic it doesn’t mean the film is. It leans too heavily on that crutch and it bothered me, even outside of the film’s apparent limitations. Fair enough – as I said, I liked elements of the film, but on the whole it never cohered for me. I think Wahlberg’s disappointing performance (I’m normally a big fan of him …in the right role) and the aggressive jingoism of the film really put me off.